Delaware State University is also featured in our ranking Top 25 Most Affordable Online Bachelor’s in Accounting. Delaware State University began as the Delaware College for Colored Students in 1891. The school began under the Morrill Act of 1890 which created land-grant colleges for African-American students. Using a portion of the $8,000 state appropriation, the Board of Trustees purchased land just north of Dover, the capital of Delaware. When the school opened, there was a Delaware College in Newark, which eventually became the University of Delaware. To avoid confusion, the name of the new school was changed to the State College for Colored Students, a name it kept for 54 years. The school began with five courses of study and a three-year normal program, designed to educate teachers, was added in 1897. A preparatory program was also established for students who needed additional education before they entered college-level courses. The normal school became a four-year program in 1911. The preparatory program ended in 1917, but a model grade school was established which awarded a high school diploma upon completion. In 1947, the school was renamed Delaware State College and the high school division was discontinued in 1957. The school gained university status in 1993. Today, the school is a center for research, teaching and public service. It is still considered one of the premier Historically Black Colleges and Universities in the United States. There are 4,600 students enrolled and the campus has grown from a 100-acre property when it opened in 1891 to a 356-acre campus with more than 50 buildings. Delaware State University offers a Bachelor of Science in Accounting that is available either on campus or online. Students develop the ability to think strategically, using those skills to resolve complex issues in the business world. Students are provided classroom learning as well as hands-on experience. Students are able to complete a five-year 150-credit hour program that qualifies them to sit for the Certified Public Accountant examination. Students are provided the opportunity to join student organizations, including the Accounting and Finance Club as well as the National Association of Black Accountants. These organizations provide students with networking and hands-on learning opportunities. Students are also able to gain experience through internships and professional experiences available through the university. Students are also involved with the Institute of Management Accountants and Association of Government Accountants. Students have found positions as public, management, government accountants as well as internal auditors or compliance officers. Graduates have found positions in such prestigious companies as Deloitte US, KPMG, JPMorgan Chase, WSFS Bank, Mastercard and SB & Company. Delaware State University is regionally accredited by the Middle States Commission on Higher Education. Regional accreditation confirms that students are receiving high-quality education that will prepare them for careers in their chosen field of study. The university also agrees to periodic evaluations to determine that they are meeting standards required by the agency, that they have the resources to meet their objectives and that they will address any areas that the agency determines needs improvement during the review process. Business programs at Delaware State University are accredited by the Association to Advance Collegiate Schools of Business. Students who have not earned college credit after high school graduation are entered as first-year students. They must complete an application and submit official ACT or SAT scores as well as official high school transcripts. Students must have a minimum GPA of 2.0 or higher and must score at least 800 on the ST or 17 on the ACT. Students who have earned college credit after high school graduation must complete an application and provide official transcripts from all colleges or universities attended. Students who are transferring less than 30 college credits must also provide official high school transcripts. Students who are transferring less than 12 college credits must submit official SAT and ACT scores. Students must have a cumulative GPA of 2.0 or higher and all credits must have been earned within the past ten years. Graduate applicants must complete an application and submit official transcripts from all colleges and universities attended. Students must submit official test scores and letters of recommendation. Students must have earned a bachelor’s degree or higher from an accredited college or university with a GPA of 2.5 or higher. Students must submit official GRE, GMAT or MAT scores. 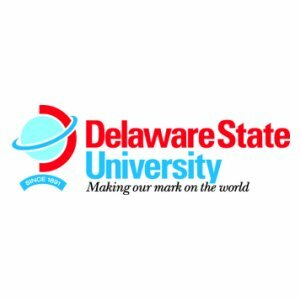 Full-time undergraduate tuition at Delaware State University is $7,868 per year and part-time tuition is $280 per credit hour for in-state students. For out-of-state students it is $16,138 per year or $638 per credit hour. Online programs are $400 per credit hour for undergraduate programs. Graduate programs offered online range between $438 and $515 per credit hour depending on the program chosen. Graduate programs offered on campus are $430 per credit hour for in-state and $948 for out-of-state students for master’s programs. Both in-state and out-of-state students pay $544 per credit hour for doctoral programs offered on campus. Financial aid is available, and students must complete the Free Application for Federal Student Aid (FAFSA) to qualify. Students may qualify for grants, scholarships, loans or work-study programs. Delaware State University also accepts employer, military and veteran’s benefits. Students must meet satisfactory academic progress in order to continue qualifying for financial aid. Delaware State College has offered outstanding education to a diverse population of students since its inception more than 120 years ago. Delaware State University offers a wide range of online programs designed with working adults in mind, allowing them to achieve their higher education goals while meeting other obligations so that they may move into a new career or advance in a current career.